A light, rhyming story imagines if Cinderella had a lesser-known twin sister. Schwartz, author of Ninja Red Riding Hood (illustrated by Dan Santat, 2014) and Goldi Rocks and the Three Bears (illustrated by Nate Wragg, 2014), knows how to spin a fractured fairy tale. 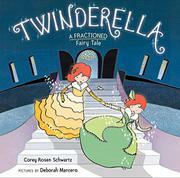 Touting itself as a “fractioned fairy tale,” however, this take on “Cinderella” proclaims that readers familiar only with the original story “don’t know the half of it!” Breezy, pun-filled rhymes introduce Cinderella’s twin, Tinderella, who uses math to divide their wicked stepmother’s chore list in half. The fraction theme continues as the girls divide and conquer tending to the mean stepsisters, splitting meager meals, and sharing a bed. And when Prince Charming announces a ball to find himself a bride and their fairy godmother comes to their rescue, the twins know how to divide the trinkets and coach in half. Vibrant, digitally enhanced illustrations rendered in ink, gouache, and watercolor capture all the merriment until, just as in the original tale, one smitten prince is left with one shoe. Since a prince can’t be divided, Tinderella, ever the mathematician, asks the fairy godmother to double him. A fitting ending explains how Cinderella and her prince became famous and wound up on the throne while Tinderella and her prince won the kingdom’s math awards and kept fractions flourishing with baby quadruplets. With the possible exception of some dark faces in crowd scenes, the cast is an all-white one.